The advent of British Summer Time and dryer conditions led to 433 runners lining up at Frimley Lodge Parkrun. Max Woods was the first of eight members to finish while Helen Clayton ran her fastest time of 2018. 304 runners helped Bracknell Parkrun celebrate their third birthday with party outfits, cake and by running the course in reverse which was novel and some sections such as the start straight ski slope and long drag from the allotments really surprised runners. The consensus was that the reverse course is a little slower so Matt Jones impressed by being only two seconds outside his best time since 2016. Dave Breslin, John Wright and Patricia Marshall also continue to show good form with their best times of the year. Rushmoor will be the host for the next SJ pacing event next weekend so a number of members practiced the course this week. Mark Pattrick was first member to finish in his fastest time at Rushmoor of 2018. Lucy Dean did a good job of dialling in her splits and Janet Venables finished in her fastest time of the year. A fair amount of Tourism this week. Phil Turner was the furthest away as took his first trip to Cardiff. Yvette Glacken completed her 60th run at Luton Wardown. John Paul Featherstone at home venue Newbury while Lisa hale and Stuart Overhill both logged outright PBs at Bushy Park with impressive times of 20:25 and 20:38 respectively. Leon The Runner – A new special event very close to our hearts, Leon celebrated his 100th Marathon and was joined by other members, some experienced marathoners themselves and others new to the 26.2 mile game. Leon has promised to write more about the day and the journey to reach this achievement so we’ll have more in the week. Lauren Askew and Jacq Hudson ran the Magna Carta Half Marathon on a course around Windsor. The results aren’t available yet but we’ll have more on this event later in the week. 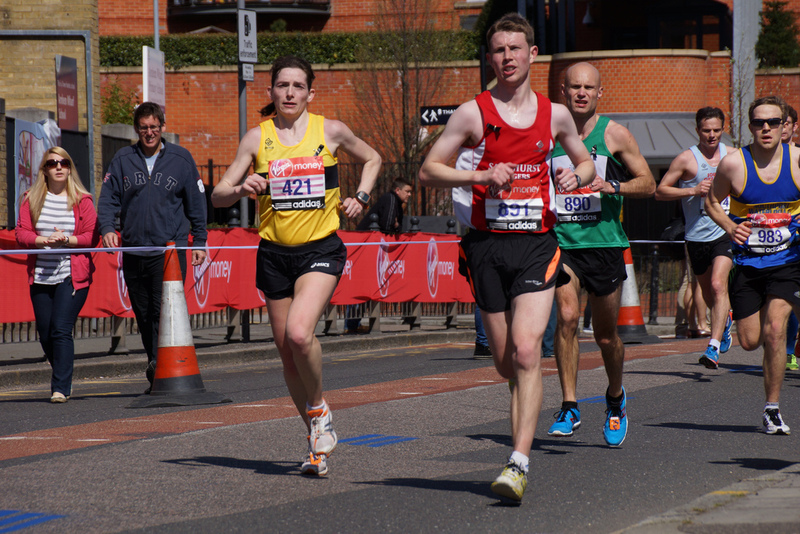 Sunday heralded the start of the spring marathon season with the Manchester Marathon where we had four members in action. Jim Laidlaw finished in 3:40:34, Gaynor Falconi in 3:46:54, Caroline Stuart in 4:12:58 and Mark Neve in 5:51:19. Stuart Holbrook made the trip over to Holland for the Rotterdam Marathon where he had a great run bagging a PB and finishing in 3:57:07. More overseas marathon action with Alistair Ingall-Tombs venturing to Italy for the Rome Marathon which he finished in 4:27:39. Angela and Mark Foker ran well at the Bournemouth Bay 10k finishing in a great time with 1:05:34. Louise Heginbotham was close behind in 1:10:24. Wednesday: It’s the second Wednesday of the month so time for the Handicap. It will be the fourth opportunity of 2018 to improve on your previous times. This four mile run over a two lap course around Crowthorne is ideal for all abilities and starts from the Morgan Rec in Crowthorne at 7:30pm. Don’t forget the post run curry at The Raj in Sandhurst. The 5k to 10k course will be running as usual from Sandhurst Memorial Park at 7pm. Thursday: This week the threshold/improvers run will be on the the Golden Retriever route. This run is suitable for all abilities and as this run grows in popularity there are even more groups of varying speed to fit with your ability. There is also a shorter route and a sweeper to make sure nobody gets left behind. Meet at Sandhurst Sports Centre at 7:30pm and don’t forget lights and high vis clothing as it’ll be dark on the unlit sections. Friday: Track is still free and the coaches have some great sessions planned for all abilities to improve fitness and technique. This is a great way to improve your running form and fitness, get faster and help prevent injury. If you’ve never ran on a track before give it a try, it’s a lot of fun and you are never more than 200m away from the start. Later on Friday night members will be celebrating at the SJ Ball at Easthampstead House. Saturday: This week it’s the SJ Pacing event at Rushmoor Parkrun. Dave Bartlett is coordinating the pacers and is still looking for runners to pace in the 35 to 40 minute window. All members are welcome to come along, help with pacing or try to improve their own best Parkrun time.